I've wanted to try Krishna inks for quite a while but their shipping prices have, in the past, been very prohibitive. I decided to take the plunge and bought 12 inks from The Pen World and I'm glad I did! Fortunately, Krishna have found a way to ship the inks, internationally, much more affordably than in the past. They still aren't cheap to ship but it's a lot better and the inks themselves are very aggressively priced at between US$2.80 and US$4.30 a bottle. The bottles themselves are small at 20ml bottles but the inks inside them really pack a punch and are certainly very unique. 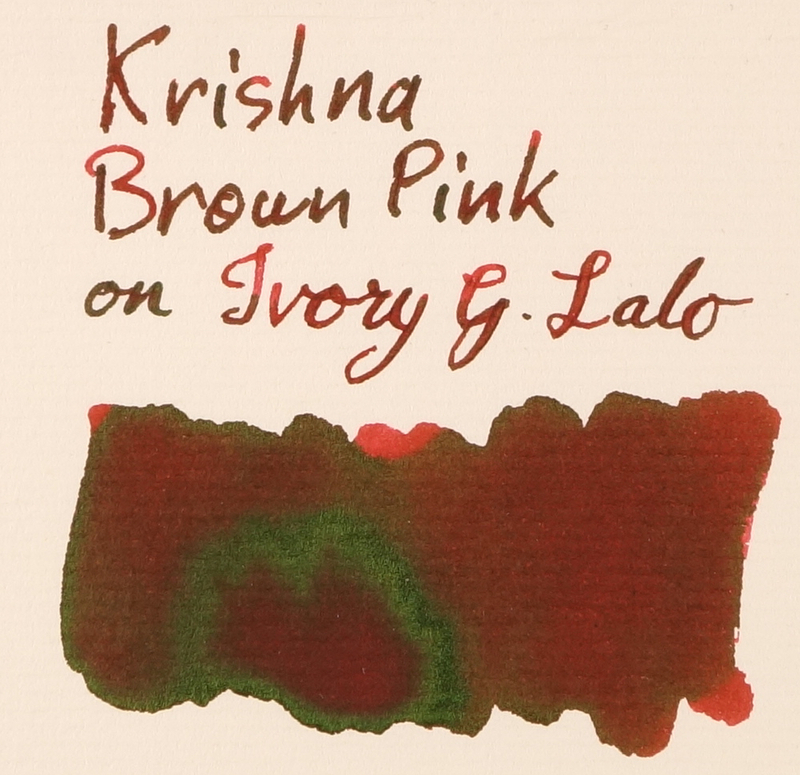 Krishna Brown Pink is more of a brown leaning red but on some papers the pink does come out more. The ink is rich and has some nice shading on many papers The ink performs very well on all papers, even cheap copy paper and a Composition Book paper (though it loses it's character on these); basically there is no feathering anywhere and certainly no bleeding on fountain pen friendly paper. It's very nicely lubricated and is rather wet out of the pen. The ink does smear a bit on Tomoe River but is good on Rhodia. Where this ink stands out is the sheen. There is a whole lot of it and it's a beautiful vibrant green sheen. Sometimes there's so much sheen that it looks more green than brown, red, or pink (such as on Cream Tomoe River below). Visually it is stunning. There's even a modicum of sheen on Composition Paper (which is a very fountain pen unfriendly paper). Rhodia never produces a tonne of sheen but there's still a noticeable amount here. The chromatography is rather appropriately brown and pink. Nothing much else to say about it. Dry times on Rhodia aren't too bad but are a little average. On Tomoe River it took quite a while to dry out. I couldn't find a an ink that stood out as very similar. De Atramentis Horse Ink (which is De Atramentis Brown) and Noodler's Omaha have the most "red" leaning browns and so are the closest I could find but Horse Ink is very flat and darker while Omaha is too cool and also darker. J. Herbin Café des îles, J. Herbin Caroube de Chyphre (which is unshaken here so the gold shimmer doesn't obscure the ink colour), and Diamine Ochre are all much too yellow. Caroube de Chyphre does, however, have the slightest hint of green sheen (which is more prominent on Tomoe River). On Tomoe River Horse Ink and Omaha became more yellow and so don't compare as well but Caroube de Chyphre is slightly more red. The green sheen of Caroube de Chyphre is similar compares well but isn't nearly as prominent as Krishna Brown Pink. Also worth noting is the lack of shimmer in this swatch and writing sample which might obscure the sheen a little. I'm a big fan of Krishna inks. I've inked three of them so far and they all perform wonderfully and are, so far, pretty unique. 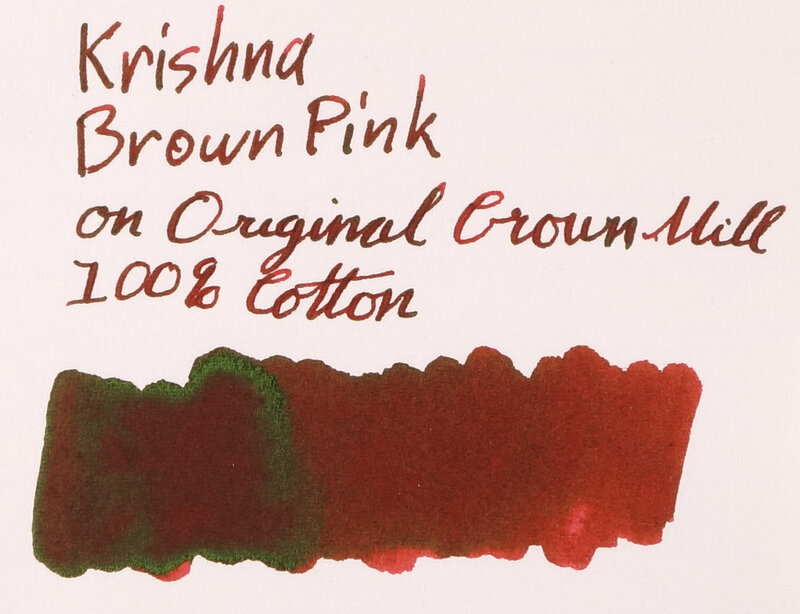 Krishna Brown Pink is no exception to that as it's an interesting brown ink with stunning green sheen. Shipping and distribution generally are the issues to face when buying this ink. When I bought my bottles from The Pen World the 12 inks it cost US$60 for shipping to Australia. That is a lot of money. That has fortunately changed now to US$25 for shipping up to 12 bottles which, while still pricy, isn't anywhere near as bad as before. If you can commit to 12 bottles of Krishna inks (which are worth it!) that's US$2 per bottle shipping and Krishna Brown Pink costs US$2.80. That's not bad but you do still have to commit to 12 bottles to get the full benefit. Group buys are definitely something to consider if you can. Alternatively, if you are in the UK then iZods has the bottles as well for £5.25 a bottle. If you can commit to the 12 bottles needed to take full advantage of the shipping price, if you can get in on or organise a group buy, or can otherwise get a hold of Krishna inks then I fully recommend doing so. Great inks.